F&M Bank’s scenic Craigsville location sits in front of Grassy Run, next to the town office and public library. As a community bank for more than one hundred years, F&M is committed to investing in the small towns where our customers and employees live and work. We do this through charitable efforts like Casual Fridays for Charity, community resources such as our free financial education guides, and opportunities to highlight talented residents as in our annual calendar photography contest. F&M Bank Corp., our parent company, has ranked 4th out of 13 Virginia banks on the American Banker’s top 200 list of publicly traded community banks. Our Craigsville bank is adjacent to IGA market and CITGO gas station. There is plenty of parking in front of our one-story brick building. Inside you’ll find a responsive and knowledgeable team ready to listen to your financial needs and goals and help you identify the right solutions. 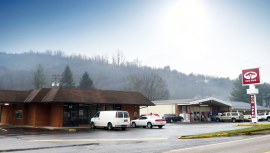 F&M Craigsville features up-to-date equipment and a full range of services.